What is so special about Red Sea Diving? The Red Sea is considered to be one of the 7 Wonders of the underwater world, harboring more than 1,000 species of invertebrates and over 200 species of soft and hard coral. This forms the basis of a marine eco-system which includes 1,100 species of fish, of which just under 20% are endemic to the Red Sea, i.e. these fish species can only been found here. The high level of endemism here is one of the main factors that makes Egypt scuba diving so interesting. Which routes can be chosen for safari? The Red Sea dive sites offer you unobstructed opportunities to spot tropical marine life in crystal clear waters, ranging from sharks and dolphins to gorgonian fans and feather-stars. Variety is in no short supply either and depending on where you choose to dive. Your diving holiday can include shallow patch reefs, drift dives and walls, or a collection of some of the most interesting wrecks you are likely to find anywhere. In other places vibrant reefs stretch out far into the sea and form intricate labyrinths of plateaus, lagoons, caves and gardens. Our scuba trips cover most of the Egyptian Red Sea from Dahab in the North to Halaib in the South with way over a hundred dive sites in between. Obviously, we cannot visit all of the Red Sea dive sites within 1 week, so we custom made more than a dozen of itineraries, that proved to be exciting and successful through the years of our operations. There are more than 30 ship wrecks that rest north of Hurghada. We developed a few itineraries there to visit the most interesting of them, from 19th century Carnatic to World War 2 Thistlegorm. Our dive guides will not only guide you around and inside these wrecks, but will also give you a detailed story of these vessels. Sothern routes will bring you to the walls of Elphinstone and coral caves of St. Jones, you will swim with dolphins at Dolphin Reef and have a chance to meet Marsa Alam manatee. Coral marine life and sharks are the main attraction in the southern part of Egyptian Red Sea. Day 2. Dabab reef, Elphinstone. Day 2. Abu Dabab reef, Elphinstone. Does Heaven Saphir provide unlimited Nitrox and tech diving support? M/Y Heaven Saphir is equipped with nitrox membrane compressor that will supply you with unlimited nitrox throughout your scuba trip. We will supply you with trimix for your technical diving. We have 2 inflatables with Yamaha 40 HP each that we use on some divesites where diving from the liveaboard is impossible. We have a big tank of pure oxygen on board along with a medicine chest, but we truly hope you will never need it. There are two pressure chambers on the coast and the liveraboard is equipped with satellite telephone and UHF radio for swift contact with coast guards in case of emergency. Lots of folks have been asking us this question. Man, it is safe in Egypt? Is it safe in Hurghada? The correct answer is: it is much safer in Egypt than, for example, in France, Belgium, England or Germany. Tourism is the second largest industry in Egypt, it brings bread and butter to millions of Egyptians, over 10 million tourists from all over the world visit Egypt annually. There’s a daily flight to Cairo from JFK 7 days a week. Hurghada receives more than 50 flights daily. Would it be the case if it’s not safe? Safety is our priority. From the minute we meet you at the airport till your departure we care about you. Our dive guides are completely prepared for any unforeseen underwater situation and are capable of any type of rescue. We have a big bottle of pure oxygen on board along with a medicine chest, but we truly hope you will never need it. There are two pressure chambers on the coast and the liveraboard is equipped with satellite telephone and UHF radio for swift contact with coast guards in case of emergency. 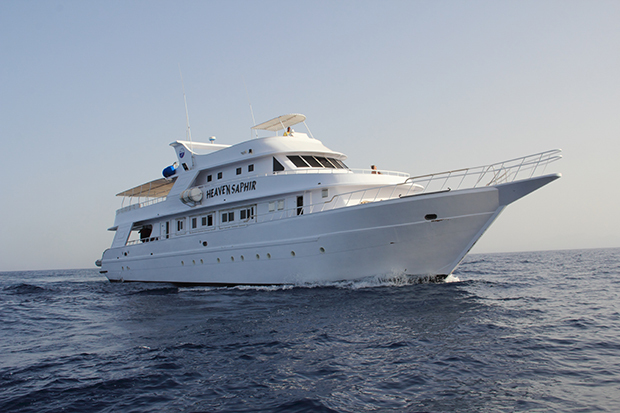 Why divers choose M/Y Heaven Saphir Red Sea liveaboard? Discover Red Sea diving safari on board M/Y Heaven Saphir!